You are invited to a wedding and are puzzling over what to choose – totally no ideas! The most popular idea for a wedding guest is a dress but what if you don’t have a proper one at hand and don’t have any time for shopping? Don’t worry, girls, this roundup will tell you how to create an easy, modern and fail-proof outfit to attend a wedding and in most of these outfits you’ll be able to use what you already have in your closet. No shopping fuss and no breaking banks! Let’s begin! Most of us have some pants or trendy culottes at home, and you may easily style them to attend a wedding. How? Put on your pants and add a statement top – an off the shoulder one with draperies, a deeply cut one, a floral one or, if your pants or culottes are bright ones, for example, floral ones, you may go vice versa and finish them off with a white blouse with puff sleeves, a plunging neckline top or a neutral tan one. Pantsuits are all the rage this year, and you may style your usual pantsuit, in which you go to work, for a wedding. Add a statement top if the pantsuit is of a basic color or a neutral top if you have a bright suit, add heels and a small clutch, plus statement jewelry and you are good to go! Jumpsuits are worn to work, too, and if you have one at hand – this is your choice for a wedding! Style it with statement jewelry, heels and a tiny clutch, if it’s cold, add a blazer. 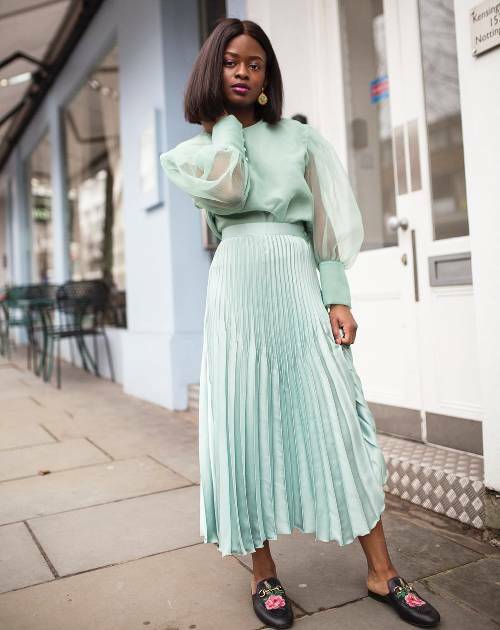 Have a pleated midi? This is a base for your wedding guest outfit! If the midi is bright or metallic, you’ll need a neutral top – a basic silk one, a white button down or a blouse. If the midi is rather neutral, your way to go is adding a statement top – a crop top, a bold printed or just bright one. If you don’t have a matching pair, create a bold color block outfit – take a different top and skirt and tie them up with shoes and a bag.